If you’re an amateur cook like me, or just enjoy wholesome food, you’ve probably noticed that there’s something deeply wrong with the way much of our food is produced and processed. 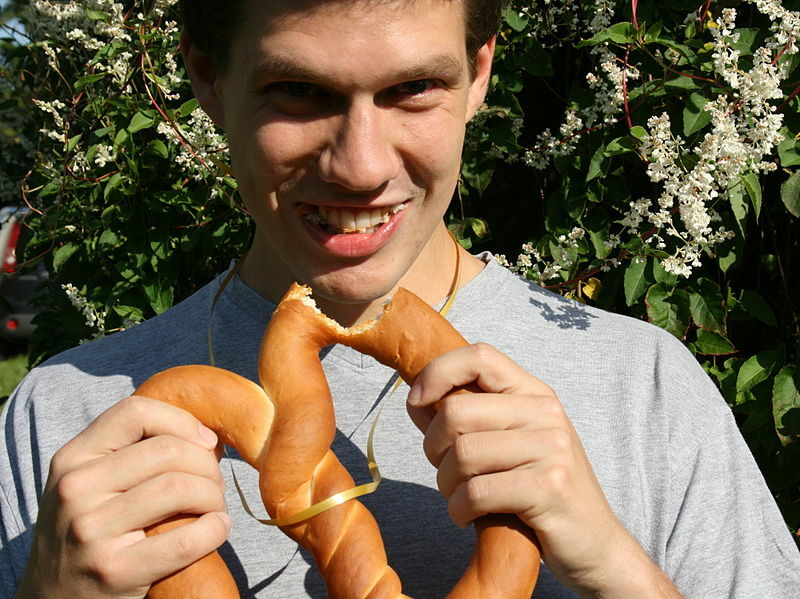 In today’s mass consumer market, it’s easy to feel like a number when you ask simple questions about your food. The fact is that basic information such as where a product comes from, how it is made, and where the raw materials were sourced are mysteries not just to the consumer, but even to the general managers of many retail stores or restaurants. One factor is a growing abyss between producer and customer resulting from a frenetic drive to maximize profits. Another factor is a lack of moral responsibility. In today’s global market, mass standardized products are rarely suited to one’s individuality and the consumer is being increasingly forced to accept fewer options although packaging may be varied. And it’s no different in the food industry. 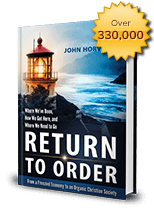 In his just released book, Return to Order: From a Frenzied Economy to an Organic Christian Society, author John Horvat explains that this frenetic drive is the result of an increasing desire in society to throw off all restraint, and to gratify disordered passions. He calls this phenomenon frenetic intemperance and demonstrates the myriad ways this vice affects society and throws our economy out of balance. And, although this approach to business can build huge fortunes it also has the capacity to bulldoze values and people which stand in its path. I recently felt this frenetic bulldozing drive to maximize profits on my own skin. While it may not be surprising to know that a SUBWAY sandwich could contain a combination of meats from several different countries, all sorts of chemicals,1 and that those “fresh” meats have been sitting in storage for many weeks,2 it should be surprising that high-end restaurant franchises are also progressively becoming outlets where it’s impossible to get answers about their food. I experienced this with a colleague at a recent visit to The Cheese Cake Factory. After having a $22 farmed-fish dish, I was curious about how and where their cheese cakes were made. As a well-dressed man walked by I asked him, “Do you work here?” “Yes,” was the answer. He was actually the general manager. I then asked him whether his cheese cakes were baked in a bain-marie (water bath). “No,” he replied, “our cheese cakes are made in a factory, either in South Carolina or California and are shipped frozen. “No, they’re baked in an oven,” he said. Just fifty years ago, this would have been an unlikely exchange with the general manager of any restaurant. Worse yet, I had this same conversation with a different manager five minutes later. And, although he had heard of a bain-marie, he did not know the method employed to make his cheese cakes. Upon arriving home, I was determined to get an answer to my question. But, nowhere could I find anything on The Cheese Cake Factory’s web site about how their cheese cakes are made. What I did find, however, was even more surprising: They claim to make their menu items fresh from scratch daily – the opposite from what the general manager claimed. The website reads: “We prepare our menu items from scratch daily at our restaurants using high quality, fresh ingredients.” And cheese cake is the signature item on the menu – of course. So I decided to write a letter explaining my experience and asking for answers. But, not before running into another road block. This experience was my eureka moment confirming just one of Mr. Horvat’s theses in his groundbreaking work Return to Order. In a real consumer-driven market, the consumers’ needs are of primary concern. On the contrary, in a market possessed by frenetic intemperance the drive to maximize profits issues forth a feverish war to expand production and profits, thereby making mass standardization a necessity. If the customer wants to know something beyond the producer’s standardized straitjacket formulae, he may find himself bulldozed under. I asked both your managers (Arlington, Va.) whether you bake your cheese cakes in a bain-marie (water bath). Neither knew how to answer this elementary question, the general manager not even knowing what a bain-marie was (forcing me to ask the question three times). “We prepare our menu items from scratch daily at our restaurants using high quality, fresh ingredients.” Perhaps a little disingenuous? This contradiction is a profound expression of the growing separation of the producer from the consumer; nay, the growing separation of the producer from even the producer. Your managers didn’t even know what process was used to bake your banner product: cheese cake. The rule of money over the rule of honor? I’m quite sure I know the answer to what your managers didn’t know. I just don’t know why you would say “your menu items are prepared from scratch daily” when it’s not true. This entry was posted in Featured and tagged America, book signing, false happiness, Family, financial speculation, frenetic intemperance, leadership, marvelous, Return to Order by John Horvat II. Bookmark the permalink.